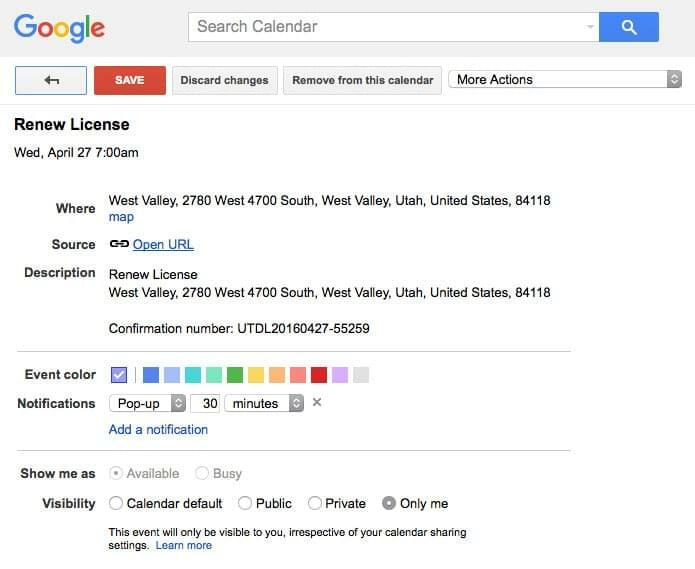 In order to enable a more seamless interaction with online services, Utah.Gov has enabled Google Now Cards to be included in appointment notification emails from the Driver License Division. Residents of Utah can use the Driver License Scheduler application to schedule an appointment to apply for a License, a Leaner Permit, or many other services. Appointment emails sent to the resident are programmed to automatically add the scheduled appointment to the user's Google calendar and to activate Google Now reminder cards, alerting the resident before the appointment with maps and directions. The structured markup included in the Driver License appointment emails allows Google Now to automatically add appointments to Google calendars and reminders. The Google Now Cards are available on most Android phones and any iPhones using the Google app and Gmail. This new innovation streamlines the appointment schedules by reminding more people to show up to their assigned appointments.